A clean glove provides proper traction on the club. Perma Soft golf gloves, which are made by Titleist, can help you obtain a better grip on your clubs. 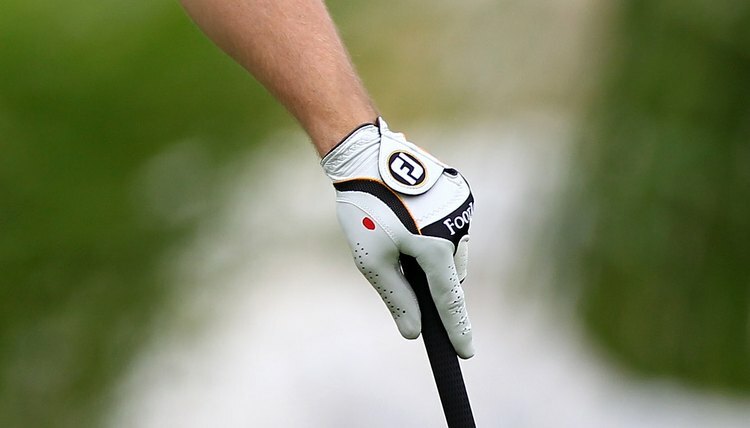 After playing 18 holes or more, you might notice stains on these gloves. Instructions that come with the gloves advise owners that the gloves are not machine washable. This is because Perma Soft golf gloves are made from leather. As with other leather items, though, you can clean Perma Soft golf gloves as long as you take the proper precautions and are gentle while cleaning. Brush away any visible dirt or debris from the Perma Soft golf glove. This can be done either with your hands or a soft brush. Fold the soft cloth in half. Turn your faucet on slightly so that it is barely dripping water. Place one side of the folded cloth under the dripping water. Be sure to get the entire side of the cloth wet but do not oversaturate it. Add about five drops of soap to the top of the wet portion of the folded cloth. Use the soap-covered portion of the cloth to wipe off your Perma Soft golf glove. You can choose to wipe only the dirty portions of the glove or you can wipe the entire outside of the glove. Turn the Perma Soft golf glove inside out if possible. Add an extra drop or two of soap to the already soapy portion of the cloth. Wipe the inside of the glove. If you cannot turn the glove inside out, simply wipe the inside of the glove with the cloth. Turn the cloth around to the side that is wet but not soapy and wipe both the outside and inside of the glove. Doing this can help remove any leftover dirt and soap from the glove. Turn the cloth to the dry side. Wipe the glove one final time in order to remove moisture. Hang your Perma Soft golf glove so that it can air dry. If you want to speed up the drying process, you can place the glove in front of a fan. Do not place it in front of a heater, though, as this could ruin the glove. How Do I Clean a Golf Glove?